Julia is a very outgoing little girl. She likes to draw and color, and she also enjoys reading books. After the eye screening at Julia’s school, it was recommended that she be seen by an eye doctor. 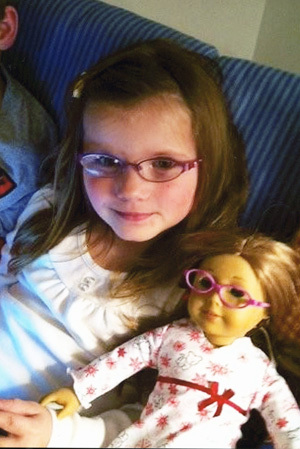 Julia’s mother was surprised because she had no idea her daughter had a vision problem. The results from the screening indicated that Julia was very farsighted in her right eye, while her left eye was normal. A difference such as this can indicate or lead to amblyopia (commonly called lazy eye). The earlier this condition is detected, the easier it is to correct. A visit to the eye doctor confirmed the screening results, and glasses were prescribed. Julia picked out the cutest pink pair of glasses, with little hearts on them, and she was excited to receive them. With her new glasses, Julia is excelling in school. Julia’s mother is thankful for the program that detected her daughter’s vision problem and got her on the path to having it corrected.